With recent typhoons battering the area and Manila being named the second most vulnerable city to climate change, risk reduction is the key. 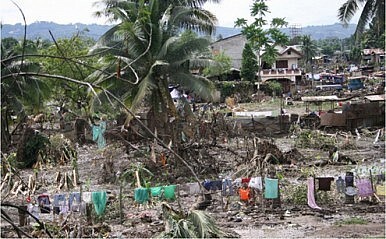 Almost a year after Typhoon “Sendong” devastated the cities of Cagayan de Oro and Iligan in the northern part of Mindanao, Philippines in December 2011, the historically “typhoon-free” island experienced another similarly rare and intense tropical storm that struck earlier this month. Super Typhoon “Pablo” slammed into Siquijor, Misamis Oriental, Surigao del Sur, Agusan del Sur, Compostela Valley, and Davao Oriental, hitting some of the same cities and towns still recovering from the havoc suffered during Sendong. According to the Philippines Atmospheric, Geophysical, and Astronomical Services Administration (PAGASA), Pablo was 375 miles in diameter and packed gusts up to 130 mph with torrential rains that averaged one inch per hour. Likewise, when Sendong made landfall, it dumped more than a month’s worth of average rainfall in just 12 hours, sparking flash floods in the middle of the night and trapping hundreds of thousands of residents. In relation to 40 years of meteorological records, Mindanao has not experienced such storms, heavy rainfall, and landslides since Typhoon Titang hit back in 1970. According to the National Disaster Risk Reduction and Management Council(NDRRMC), as of December 18th, the death toll from Pablo had reached 1,046 people with 841 still missing, with agriculture damages likely to reach $398 million, infrastructure damage equaling $190.4 million, and private property losses of $1.2 million. The same source later said the death toll was likely to top 1,500 people killed. Some blame the high death toll and Mindanao’s extreme vulnerability to such strong storms, floods, and landslides on the unabated illegal logging and mining operations in the area. However, there isn’t much scientific evidence from past flood tragedies to confirm this theory. The Society of Filipino Foresters issued a statement earlier this year referencing past typhoons Ondoy (2009) and Sendong (2011) and recognizing the fact that “forests can help minimize but cannot totally prevent the occurrence of floods,” and that massive floods are more a result of weak infrastructure and the ever increasing amount of moisture in the atmosphere. Although deforestation and environmental degradation play a role in amplifying the destruction that occurs during such extreme weather events, climate change is a greater factor in determining the severity of flooding than the cut logs and debris that clog waterways and lead to overflowing river banks. In the same sense, weak disaster preparedness and disaster risk management plans are also partly to blame for the large number of lives lost in natural disasters and for continuing to allow populations to live in geo-hazardous areas. In the Philippines, a lucrative industry puts an endangered species at risk. Road to Nowhere? Peace Efforts in the Southern PhilippinesAsia’s Gay-Friendliest Nation?The Philippines’ China Dam ControversyIs the Philippines’ Pro-China Policy Working?A Year After Marawi, What’s Left of ISIS in the Philippines?